RED BANK, NJ Diversified Graphic Machinery, a global leader in print enhancement technology has announced the sale and installation of a Die Co-Ordinator prepress die registration system at Utah Paper Box in Salt Lake City, Utah. The Die Co-Ordinator, manufactured by Insight Graphic Systems and exclusively distributed by DGM is designed for foil stamping and embossing and reduces overall setup time by up to 50%. Utah Paper Box is a fifth generation, family owned business and one of the leading print and packaging companies in North America. The company, which marks its 100th anniversary in 2014 is gradually shifting all of its production to a new, state-of-the-art, LEED Gold Certified facility in Salt Lake City. UPB strives to achieve the highest quality finished products in the most efficient manner, and this, coupled with increased demand for folding cartons led them to their choice of the Die Co-Ordinator from DGM. The machine was installed and running in one day and is now drastically accelerating the production of die-cut masterpieces for this state of the art finisher. 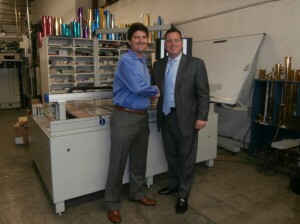 “The Die-Co-Ordinator had enjoyed tremendous success and acceptance this past year and are delighted that Utah Paper Box, one of the premier packaging companies in North America has selected DGM to provide the most flexible and cost-effective die lock-up system on the market today,” said Michael DeBard, President, Diversified Graphic Machinery. The Die Co-Ordinator from DGM works with all flatbed platen foil stamping and embossing presses that have removable honeycombs and requires no modification to presses, honeycombs, dies or hooks. It digitally locks up your Foil Stamping and/or Embossing dies from your digital print file onto your Honeycomb. The user friendly Die-Coordinator has the ability to lock up various press sizes from small presses up to 60″ presses. It is the proven system for the cosmetic packaging, greeting card, book component, label, tobacco, premium wine & spirits industries and more. Utah Paper Box has also purchased a unique configuration of DGM’s exclusive Foildex™ Cold Foil System with Interdeck Docking Ports and a Filmdex™ Cast and Cure™ System, which will be installed on a manroland 707 press in their ultra modern facility during the coming months.